In a medium frying pan on medium low heat, drizzle a couple tablespoons of olive oil over the cubed eggplant and sprinkle with some salt. Toss to coat. Cook for about 15 minutes, stirring often. Cook until you can smash the eggplant easily with the back of a fork. Mash and add garlic. Cook for an additional minute and remove from heat. Let cool. In a large bowl, pour in the mostly cooled eggplant and all the other ingredients. Start with the 1/4 cup bread crumbs and add more as you need it. The burger should be moist, but not too sticky. To form the patties, my favorite way is to use plastic wrap and a small tupperware. Find a tupperware that’s bottom is about the right round size for the burger. Lay a sheet of plastic wrap over it letting the edges hang out the sides. Place some burger in the tupperware and press into shape with a rubber scrapper. Using the plastic hanging over the edges as handles, lift the burger out of the mold and wrap with the rest of the plastic wrap. Place in the freezer and continue with the rest of the burgers. To cook, place a little olive oil in a frying pan and place unwrapped burger on top. Cook for 5-7 minutes on each side. Try not to flip too many times. These burgers are on the fragile side. Serve with some caramelized onions or fresh tomato or a pesto aioli. Definitely the best veggie burger I’ve ever had. Again, I didn’t miss the meat and can easily eat this burger twice or three times a week. Leslie, so glad you’re back. I’ve been wondering where you went! These look delicious, I love veggie burgers. I actually have some summer squash that needs to be used up… maybe I’ll try making theminto burgers! Great idea Roxan! Sounds delicious! looks delicious! what a great site – would love to have you do a guest post on mine since you’re also an actress and foodie!!! WoW!! I love eggplant…looks delicious! 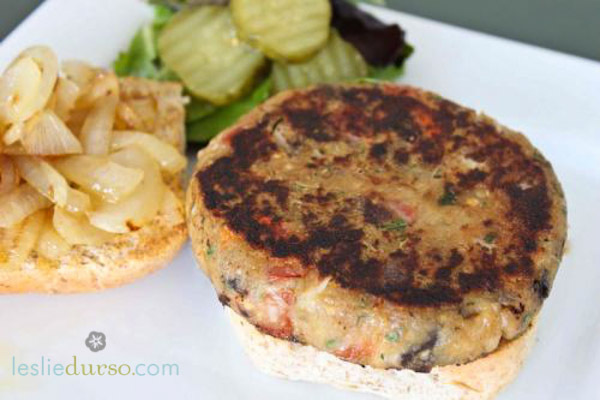 My son, who only eats big beefy burgers, loved this eggplant burger recipe. I grow japanese eggplant every year because they look so pretty in the garden and then just give them away. Now I have an actual recipe for my bumper crop this year. Thanks very much! If you cook these patties from frozen, to you have to thaw or can you cook right away as directed? Not sure if I’ll come back to this site… trying to print you can’t highlight and select to print just the selection which makes it really wasteful on ink and paper…. hope you can fix that. Looks good! I have all the ingredients, so I am gonna try it tomorrow. Thank you for the recipe.